For years, St. Louis Cardinals lead off man and franchise face Matt Carpenter has been helping to spread the goodness of the Turnpike Troubadours by featuring their song “Long Hot Summer Day” as his walk up music when he goes to bat. As the long-time lead off man for the team, that means a Turnpike Troubadours song is one of the first things fans hear in 50% of games since he began featuring the song in 2012. Showcasing “Long Hot Summer Day” at Cardinals games is one of the reasons the Turnpike Troubadours have cultivated such a strong fan base in St. Louis and surrounding areas, and “Long Hot Summer Day” was even featured in The World Series when the Cardinals went in 2013. Making references to the Illinois River and numerous small towns behind an infectious rhythm, it’s a song that’s hard not to love, and is a staple of the Turnpike Troubadours live show. The song was originally written and recorded by bluegrass legend John Hartford. However Carpenter has added a new song to his rotation for the 2019 season. “Hurricane” by Band of Heathens is now #2 in his walk up music list. An older song written by Thom Schuyler, Keith Stegall and Stewart Harrisby, and recorded by Levon Helm and Leon Everette in the early 80’s, Band Of Heathens revived the song for their record Top Hat Crown and Clapmaster’s Son. It has since become the Austin-based band’s biggest hit. Then coming in at #3 is arguably the biggest song from Ft. Worth native Cody Jinks. “Loud and Heavy” has been Cody’s signature tune ever since it was featured on his 2015 record Adobe Sessions, and is now his most streamed and best-selling song. It’s also what he chose to name his own personally-curated festival after. Now it will join “Long Hot Summer Day” and “Hurricane” being heard over the loudspeakers at Cardinals home games at Busch Stadium in St. Louis, as well as being piped into the homes of millions of TV viewers of both the home and away team during Cardinals home games. 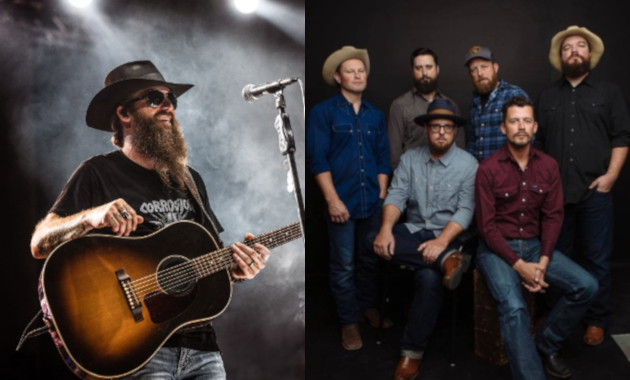 Cody Jinks happens to be a big Texas Rangers fan, but he probably won’t mind a Cardinals player embracing the song. Even though radio continues to ignore many of the independent artists who’ve cultivated strong careers and huge fan bases, good music tends to still find its way to people in the end. Matt Carpenter of the St. Louis Cardinals continues to be one of those outlets. That would make a good article. The best country walk up songs in baseball. I know Will Harris of the Houston Astros comes in to “When the Man Comes Around” by Johnny Cash. “Top Hat Crown and the Clapmaster’s Son” is from 2012. C’mon Trigger, you’re a Texas guy, you should know this. Okay, well it says 2016 on Spotify, which seemed late to me. Just checked Wikipedia, and it says 2011. So I went to Amazon, which is usually the best source for dates, and it says 2017, but that’s an import. How about I just leave the date out? Screw trying to find liner note info these days. And I’d be lying if I said the Band of Heathens more than from the outside looking in, Texan or not. I believe 2011 is correct. Trigger – what’s your walk up song if you’re in the big leagues? I’m trying to reinvent my fastball from years past so I can have an entire song when I come in from the bullpen. I always thought the intro to Funk #49 would be perfect. If I had to pick country, maybe Whiskey Bent And Hell Bound by Hank Jr. or Falling With Style by Jason Boland. “Funk #49” is a good one, though I always though “Funk #48” was unfairly overshadowed. I agree that Funk #48 is overlooked unfairly and that it is a great tune. Honestly, I think Yer’ Album is the best of the Joe Walsh era James Gang (I really like the Tommy Bolin albums too). I still maintain Funk #49 is ideal for walk up music, with its distinct riff that is just right for a short sound bite. JB Shuck for the Pirates is also playing Loud and Heavy. I just think it’s so cool Andrew Cashner’s walkup song is Boys From Oklahoma. I heard Long Hot Summer day at the Astros game the other day when i was walking around in one of the stores at the stadium. It caught me by surprise but made me really happy. Glad you liked the article Trigger and shared it with your audience. My song would have been Shotgun Willie or Don’t Let the Sunshine Fool Ya’ by TVZ. Let’s give credit where credit is due: Long Hot Summer Day is a John Hartford song off of the Mark Twang album that Turnpike covered. It’s only the third or fourth best song on Mark Twang FWIW. Hartford was and is the man. Going down in flames by Stoney LaRue! I wonder what a baseball stadium’s ASCAP/BMI fees are? I believe the number of patrons and/or square footage of the venue factors in. A small bar can pay $2,000 a year. A ballpark has to be over $100,000, I would assume. And you can bet your boots they’re making them pay. They’re going after venues very aggressively these days. This is not new by any stretch of the imagination. This list was his walk up music last year I know for certain. It was late July when I was at the stadium and heard all three songs. The last time I wrote about Matt Carpenter’s walk up music was 2013—six years ago. Though it was a cool way to highlight and few cool artists and songs, and also give a search engine landing page for folks who may hear the songs and want to know what they are, or more info behind them.